Although militant feminism and female agitation were major features of the French Revolution, the woman whose name is most closely associated with this world-shattering event remains the Queen of France, Marie Antoinette. 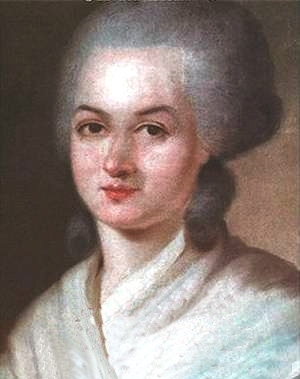 But that distinction, by revolutionary rights, belongs in truth to Olympe de Gouges. Two years before she met her grizzly fate with Madame Guillotine aged 38, Olympe wrote: “A woman has the right to mount the scaffold; she must also have the right to mount the rostrum.” For a slew of similarly bold and visionary statements – radical even within that momentous milieu – Olympe has earned the distinction of “first modern feminist” among historians such as Benoîte Groult. There is strong support for this assertion; in 1791, one year before Mary Wollstonecraft’s Vindication of the Rights of Woman, Olympe published the very first charter for women’s rights – which remains one of the most powerful and concise expressions of feminism. But Olympe did not limit her vision solely to women’s struggles: in a flurry of political pamphlets, journal articles, and broadsides published between 1789 and 1792, she championed the causes of social justice and civil rights on behalf of all the disenfranchised and underprivileged: children, the poor, the unemployed and, most controversially, slaves. (A proto-abolitionist, Olympe’s play – Slavery of Negroes – caused such an uproar when it was first performed in 1788 that the mayor of Paris condemned it as an incendiary act, fearing it would cause revolt in the French colonies.) Despite a multitude of groundbreaking contributions as playwright, agitator, reformer and author, Olympe’s name has until recent years been conspicuously, disturbingly, absent from historical records. There can be only one reason: she was a woman. Let us therefore rectify such criminal neglect and recall her finest moment, namely: Olympe de Gouge’s authorship of the Declaration of the Rights of Woman and the Female Citizen. In speaking out on behalf of the rights of women, Olympe violated traditional social boundaries that even revolutionaries held dear. But when she dared to accuse Maximilien Robespierre of despotism, her impudence could no longer be tolerated and she was arrested for sedition. Olympe was accused before the Paris Tribunal on November 2nd and condemned to die the following day. Eight months later, Robespierre was guillotined without trial. Imagine the brilliance and courage it took to generate these ideas at this time! she accomplished great things. A mover and shaker. Awesome woman. A powerful woman. Glad to know about you.